An historic race through the beautiful grounds of Bleneheim Palace, a UNESCO World Heritage Site. A great turnout for our home race on Saturday. All of our valuable marshals and helpers did a fantastic job in making it another well organised event. Tegs Jones of Witney won despite feirce competition from club-mate Sam Upton who was one second behind, with Harrier James Bolton very close behind him. Rhodie Jones was the first lady back, closely followed by Jessica Bruce. Harriers Handicap times and scores to follow. Online entries now closed. Entries on the day from 8:45am. Start/Finish: The Pleasure Gardens, Blenheim Palace, Woodstock, Oxon. Course Description: 3 laps of undulating private roads within the picturesque grounds of Blenheim Palace. There is one main hill at 2, 6 & 10 miles. Water will be available on the course in cups at the start of the second and third loop and also at the top of the main hill near Combe Gate. During the Woodstock 12, the hill up to Combe Gate brings the runner into High Garden, an ancient and undisturbed part of the Blenheim estate. Our event is being sponsored for the second year by The Mythakulon. Find out more here – mythakulon.org. Parking: Palace authorities have agreed that runners travelling by car and spectators will be admitted to the Palace grounds free of charge. Please inform the gatekeepers of your involvement in the race and they will direct you to the appropriate parking area. The main entrance to the Palace is probably the best way into the venue. Your car will be parked very close to the start/finish of the race. Entry on Foot: as above, head over to The Pleasure Gardens or ask the gatekeepers who will direct you to Race HQ. Facilities: no changing or shower facilities are available but there are public toilets at the nearby Pleasure Gardens and at the Palace. Baggage: You are welcome to leave your bag inside our admin tent (at your own risk) if you wish, however, your car will only be a few metres from the race start and finish area. Refreshments: will be available at the nearby cafe inside the Pleasure Gardens and at the main Palace restaurants and cafes. Race Numbers: WILL be posted out in advance of the day. Team Registration: teams do not need to be declared, but all team members must be wearing a club vest in order to qualify for the team competitions. Prize Giving: will take place at the start/finish area near the Pleasure Gardens at about 12:15 pm or as soon as the majority of runners have finished. Results: will be sent to all those leaving or sending a prepaid, self-addressed envelope and a £1.00 fee. Full results will appear on our website and on runbritain once processed as soon as possible after the event. Please note: event spectators and supporters will be allowed access to Blenheim Park and the event area free of charge solely for the purpose of supporting the event. There will be no right of entry to the Formal Gardens or Great Court. Woodstock Harriers AC is grateful to His Grace The Duke of Marlborough for this concession. Good luck on race day, see you there! 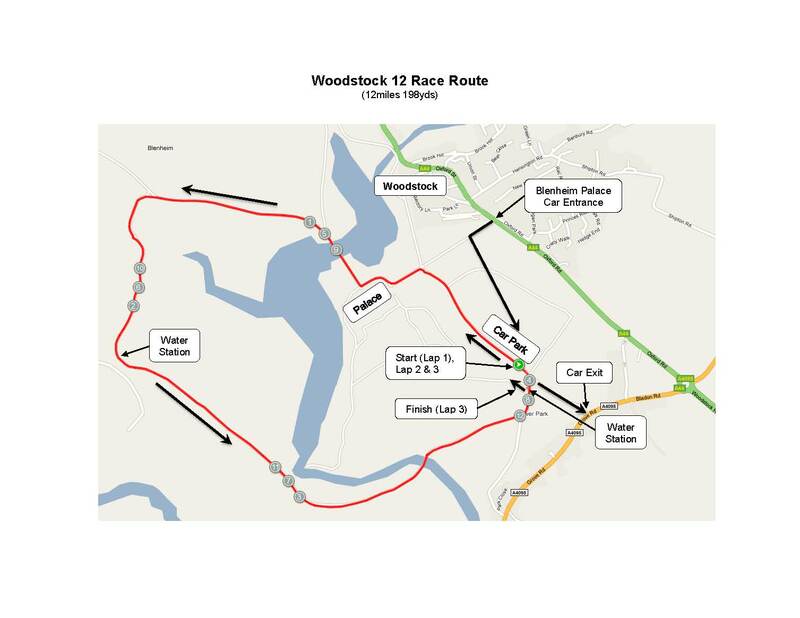 Find out more about the Woodstock Harriers, all are welcome!